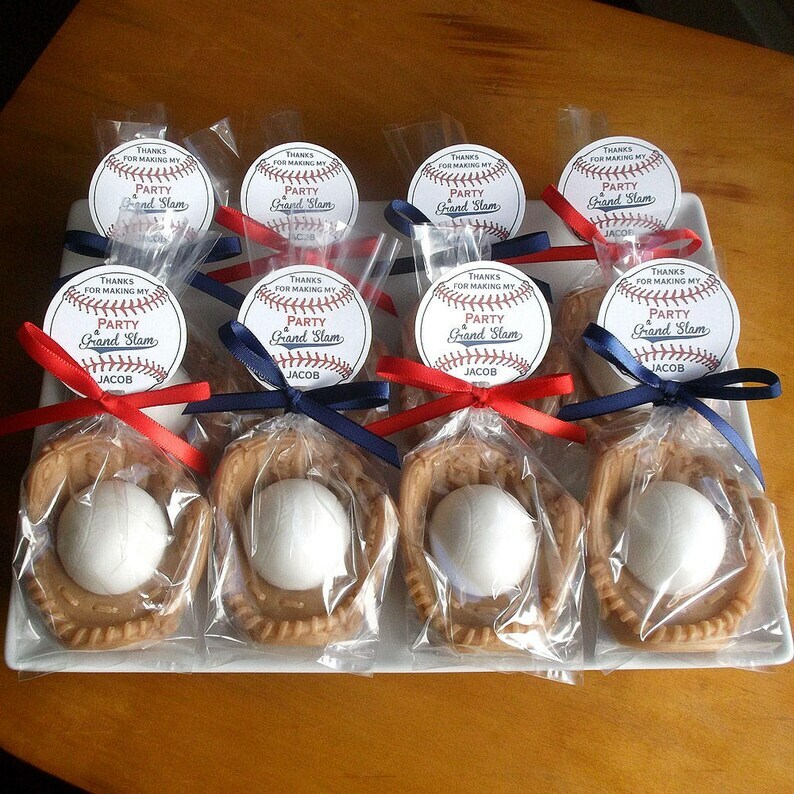 Baseball baby shower favors are unique, will add to your baby shower decorations and are sure to be a "HIT" at your baseball baby shower or gender reveal party. Set of 10 baseball baby shower favors. Brown glove with white ball. If you would like a dark brown glove or a pink or blue or yellow ball, please specify in the "Notes To" section when checking out. This option is perfect for a low budget! With this option all soaps are wrapped in a cellophane bag with a "DO NOT EAT" tag and fastened with a random color curly ribbon. You can remove the curly ribbon and replace it with your own fabric ribbon. Tags are NOT included. 1) Tag choice: see last image for tag choices. Text as is on tag. NO TEXT CHANGES. Add name if desired. 2) Ribbon color if choosing tags and ribbons. Otherwise, curly ribbon will be a random color. 3) Your party date to be sure they arrive in plenty of time for your event. Orders without dates may be delayed. Ingredients: Glycerin (kosher, of vegetable origin), Coconut Oil, Palm Oil, Safflower Oil, Purified Water, Sodium Hydroxide (saponifying agent), Sorbitol (moisturizer), Sorbitan oleate (emulsifier), Oat protein (conditioner), Fragrance, Titanium Dioxide, Iron Oxide, Mica.